With the Switch becoming ever more popular day by day its no surprise indie developers are starting to re-release a lot of their work onto the system. 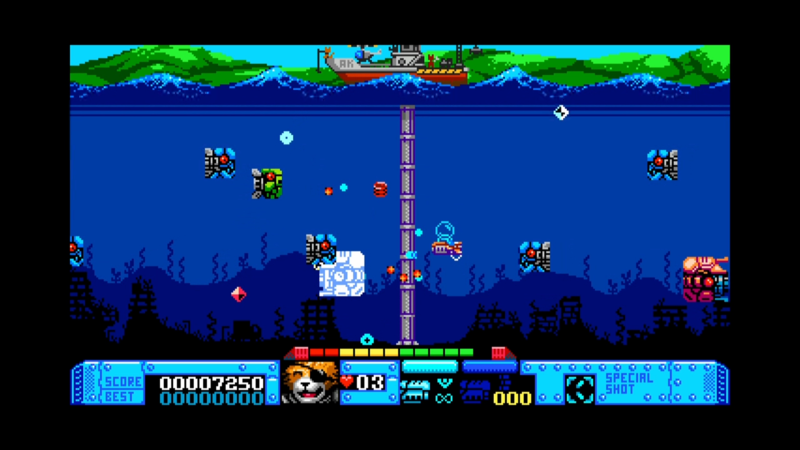 Developer Tikipod released Aqua Kitty UDX to Switch earlier this year, a game well suited to Nintendo’s hybrid handheld. Now it’s time for Rock Boshers DX to gets turn in the Switch spotlight. Both myself and Fred reviewed Rock Boshers for PS4 and PS vita and after reading the reviews again I feel everything is still relevant to how I feel about the game today. That review can be found here. Rock Boshers DX is a love letter to the micro computer days of video games. A time where several video games were developed – some in bedrooms apparently – it was a time where you would see all sorts of crazy game ideas but as the years progressed and consoles became more popular video games became more focused and everyone decided Zelda was the best game ever, the end. Okay, that’s not exactly what happened, but Rock Boshers DX also likes to play with history. You play as Young Victoria in a steam punk future set in 1880. Victoria finds a nice hat that disguises her then decides to head to Mars. After being forced to work in the mines and “bosh” some rocks, your goal is to escape and find a way home and possibly bump into Charles Darwin a few times as you do. The story is just brilliant and your curiosity to what will happen next will carry you through the games 24 stages. Once you’ve finished with the story you also have four arcade style games to enjoy which are unlocked by collecting tea, scone and cheese collectibles in the main game. Not sure I know any other game that uses this as a collectible. Rock Boshers levels are presented in single screens where you control Young Victoria from a top down view much like a twin stick shooter. The majority of the game plays out from this viewpoint, however the game will occasionally surprise you. If your a fan of space shooters you’re in for a treat. The main objective of each level is to make it to the lift (elevator) and proceed to the next segment. How you go about reaching this goal will vary. Levels will often begin with a straight forward objective where you have to sabotage a computer terminal or find a key to unlock a new area. Often as you progress through levels more enemies will be added or a large centipede will want to eat you. It’s not always predictable which helps make the game even more compelling. Often levels will come across as puzzles that need solving and may even frustrate you. Through persistence and experimentation you can make it through and feel rewarded for it without feeling the need to reach for help online. You can play the game in 8-bit console or 8-bit computer mode. 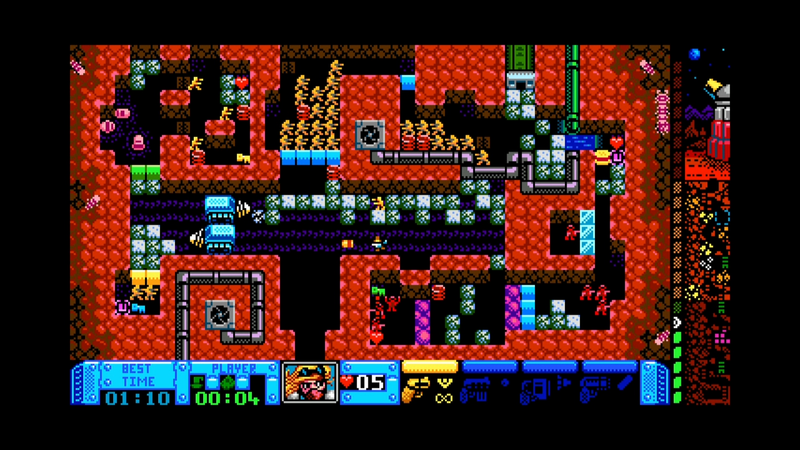 The former was added to all versions of the game some time ago but adds a little more colour to the game than its original 8-bit computer version. While it looks good and may appeal to the NES/SMS nostalgia folk, the 8-bit computer version still feels like the definitive way to play the game as it suits the titles microcomputer style, sound effects, and music. Compared to Sony versions of Rock Boshers DX the developer has made some tweaks to the Switch version. The most notable and welcome addition is rumble support. 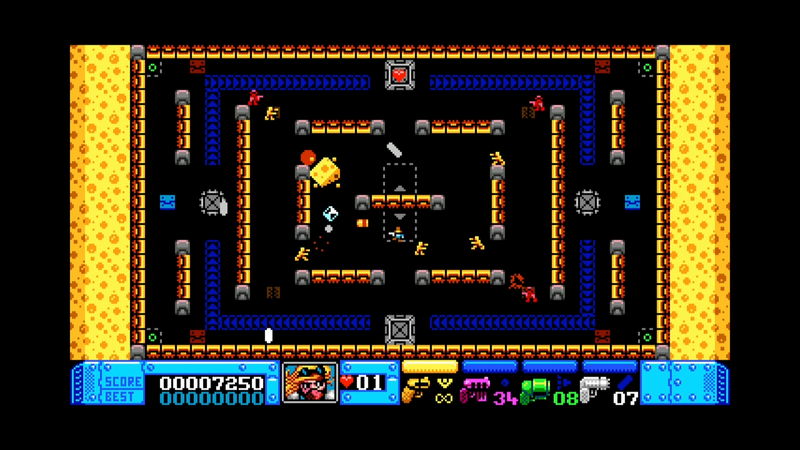 Tikipod has also improved two of the unlockable arcade games Ghost Pyramid and Bosteroids, the former being given a new level layout and the later adding additional weapons. The opening of the game has also added small animations and rumble. Since this is Nintendo and they don’t do achievements, these have been added to the game internally. While all these changes are small they make Rock Boshers on Switch the definitive version of the game. For fans of the other console versions, the Switch doesn’t include the multiplayer “battle” mode, so sadly you can’t play with a buddy over tea, cheese, and scones. You’ll just have to settle for doing this alone in a cafe while people look enviously at you. Rock Boshers DX is a great addition to the Switch library. It’s a great price for a trip down micro computer memory lane. It also goes perfectly in handheld mode with a nice cup of tea and a cheese scone. Enjoy. Not essential purchase if already own on other systems. A review copy was provided by the developer and you can read our review policy here. 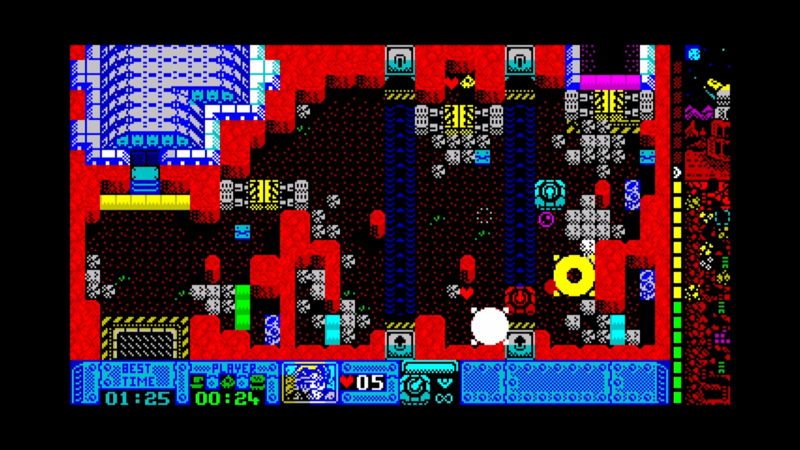 Rock Boshers DX can be found on the Nintendo eshop for an initial price of £5.39/$6.99. Please see our other review for other versions of this title.